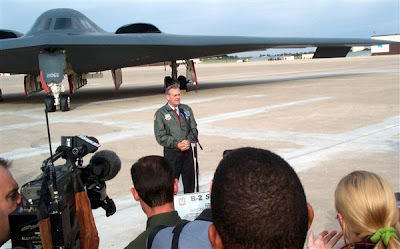 WHITEMAN AIR FORCE BASE, Mo., Oct. 19, 2001 – Amid news reports that U.S. ground troops are aiding anti-Taliban forces in Afghanistan, Defense Secretary Donald H. Rumsfeld flew to this Missouri air base today to meet B-2 Spirit bomber pilots and support crews. The secretary declined to give specifics on reported U.S. ground operations in Afghanistan. He noted that providing operations information about U.S. air attacks or the involvement of U.S. troops could imperil lives, missions and damage national security. Jeremy Scahill mentioned the speech that Donald Rumsfeld made at the Pentagon on the day before September 11, 2001 in his book Blackwater: The Rise of the World’s Most Powerful Mercenary Army. In this address Rummy outlined the streamlining of the DOD and changes in CIA policy, where radical changes would be implemented in the military, especially in the organization of the National Guard and the three branches of the armed sevices. This speech can be found on the DOD web site and should be required reading for those who are interested in the history of what is now being called The Long War. Former Soviet leader Mikhail Gorbachev on Tuesday advised President Barack Obama to prepare to withdraw forces from Afghanistan, rather than adding more troops. The USSR leader, who in 1986 began the withdrawal of Soviet troops from Afghanistan after a lengthy conflict there, said that adding more troops will be counterproductive.